Wow! Your party guests will be in awe of this 55' fantastic obstacle course full of ups, downs, bounces and fun! 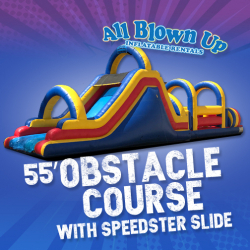 This is designed for kids that really love competition or just a bigger course to romp around in. The Speedster Slide at the end makes for some amazingly fun action!